MEXICO CITY (AP) — U.S. immigration authorities began flying deportees deep into Mexico Thursday in an effort to discourage them from trying to return, U.S. and Mexican officials said. The first of twice-weekly flights from El Paso, Texas, to Mexico City left Thursday with 133 deportees aboard, all men. ICE spokeswoman Nicole Navas said the flights will accommodate up to 136 men and women but no children. Deportees fly from throughout the United States to Chaparral, New Mexico, for a short bus ride to El Paso. The flights are not voluntary, unlike a previous program to deport Mexicans arrested by the Border Patrol during Arizona’s deadly summer heat. Mexico’s National Migration Institute said the flights will last six months, taking place every Tuesday and Thursday, and the Mexican government will pay for returnees’ travel from the Mexico City airport to their hometowns. A total of 6,800 people are expected to be returned under the program. Special accommodations are being made for minors traveling alone, Mexico said. Under a two-month trial last year, more than 2,300 Mexicans returned on 18 flights. The U.S. and Mexico agreed in April to make the arrangement permanent. ICE has long flown home deportees who are from countries that don’t share a land border with the U.S., most commonly Central Americans. Mexicans, who account for the vast majority people living in the U.S. illegally, are traditionally sent by plane or bus to a city along the 1,954-mile (3,145-kilometer) border with Mexico. Thursday’s flight marks the beginning for regular air travel to Mexicans who are deported, a welcome development for authorities in Tijuana and other Mexican border cities who have complained they are getting overwhelmed by unemployed newcomers. It comes as House Republicans are resisting the broadest changes to U.S. immigration laws in nearly three decades. The Senate has approved a plan that would offer a path to citizenship for an estimated 11 million people living in the U.S. illegally. President Barack Obama has backed the proposed overhaul, while at the same time increasing deportations. His administration topped 400,000 deportations during the 2012 fiscal year. A very welcome development, good news indeed. MABINI, the Philippines — Mediterranean-inspired, pastel-colored houses dot the coast and hills of this rural town in the Philippines, dwarfing their traditional counterparts made of unpainted concrete blocks under roofs of corrugated zinc. The larger houses, barely inhabited, many of them empty, belong to overseas workers who plan to return here one day. In one village nicknamed Little Italy, where a quarter of the 1,200 residents are working in Italy, the overseas workers paid 20 percent of the cost to construct a public hall. Remittances, which the government says have been rising sharply — from $7.6 billion in 2003 to $17.3 billion in 2009 — now account for more than 10 percent of the Philippines’ gross domestic product. The payments are also the main factor driving the country’s recent economic growth, which would have otherwise remained stagnant. But critics, including many overseas workers, say the government has developed an unhealthy dependence on the remittances, turning a blind eye to their social costs, especially divided families and the reliance on them to pay for services while failing to build a sound economy that produces good jobs at home. About 15 percent of the 42,000 residents of Mabini, about 80 miles south of Manila, live overseas — typically working as maids, nurses or service workers — compared with an estimated national average of 10 percent. One recent morning, Jocelyn Santia, 40, was packing her bags after two months of vacation here to return to her job as a housekeeper in Milan. She and her husband, who died six years ago, began working in Italy 20 years ago after being recruited by an employment agency. Her grandparents and a brother raised her four children here, though the two eldest now attend college in Italy. Her sacrifice, she hoped, would yield good, white-collar jobs for her children. But with her departure — and yet another separation from her two younger children — looming before her, she expressed bitterness about having to leave her family. Nilo Villanueva, the mayor of Mabini, said he had often heard this criticism from overseas workers. Mr. Villanueva was elected in 2007 by campaigning in Italy and championing the interests of overseas workers. The mayor connected Little Italy to the water grid last year. Yet, even as Mr. Villanueva has sought overseas workers’ investments in a feed mill and other projects, he said he worried about the town and country’s reliance on remittances. “Many people have become lazy now because they are overdependent on remittances,” he said. He said the municipality not only counted on investment from its overseas workers, but also had become dependent on their earnings in less direct ways. Most overseas workers here, for example, send their children to private elementary schools, which have smaller class sizes and offer richer educational and extracurricular programs. “They are helping the municipal government because we are spending less on public schools,” Mr. Villanueva said. At the private Santa Fe Integrated School, which charges an annual tuition of $370, 80 percent of the 250 students are children of overseas workers. About half have both parents overseas and are being raised by relatives or housekeepers, said Louella D. de Leon, the principal. Kate Michele Mendoza, 12, and her sister Christina, 8, are typical cases. With their parents working in Italy since Kate Michele’s birth, they live with their grandparents and two cousins, whose parents work in Oman. The parents return here once a year, staying one to two months. “We go malling when they are here,” Kate Michele said. Ms. de Leon said that while the children of overseas workers were better off financially, they lacked discipline and scored poorer grades than the children whose parents were present. The national government has highlighted the positive effects of the O.F.W. economy, calling the workers “heroes” and presenting awards for the model O.F.W. family of the year. In an interview in Manila, Vivian F. Tornea, a director at the Department of Labor’s Overseas Workers Welfare Administration, said the benefits of the remittance economy far outweighed the costs. Ms. Tornea denied that the national and local governments had become dependent on remittances, saying that overseas workers’ contributions to building public infrastructure were simply “payback” because they did not pay income taxes. “Just as we get assistance from other funding institutions, why can’t we accept from our own nationals who are willing and capable of giving something for their own community?” she asked. While the government has welcomed the overseas workers’ remittances, it has done too little to ensure their long-term financial health, critics say. Atikha, a private organization here, provides financial literacy programs for overseas workers who, here in Mabini and elsewhere, tend to invest in houses and vehicles that remain unused for years. In the Pulong Lupa neighborhood, about half of the houses belong to absent overseas workers. No one answered the doorbell at several houses, but a caretaker, Jovel Bonapos, 16, appeared at the gate of a large pink house. The house, he said, belonged to a couple and their four children living in Italy. They visited only once every two years, staying up to two months each time. The house had four bedrooms and three bathrooms, and it is “completely furnished,” he said. In a large house not too far away, Lorena Sawali-Baquillos, 37, lives with her three children while her husband works as a seaman. Ms. Sawali-Baquillos, who leads a small organization of O.F.W. families, said she understood the motivation behind building the Italian-style houses. In 1950, Seikichi Iha was accepted to begin the formal study of karate with Shinpan Gusukuma (the kanji of his family name are also pronounced “Shiroma” in Japan), a student of Anko Itosu, at his dojo in Shuri City. Shinpan Gusukuma was well educated-working as a school teacher and also known for his skills as an acupuncturist. A student of Anko Itosu, Shinpan Gusukuma also studied under many other master teachers in different styles. He selected Shorin-ryu as his primary interest. Sensei Iha explains that in the past, Okinawan karate students might study with a variety of teachers. Someone would hear about a person who was good at a particular kata or technique and then go ask that person to teach him. Iha notes that due to Gusukuma’s schedule as a school teacher-teaching a few hours every day with summers off-he was able to concentrate on advancing his own practice of karate. A friend of Iha’s encouraged him to begin karate with Gusukuma who, at that time, was in his 60’s. Twice a week after work, Iha walked two hours from his home in Nishihara to the Gusukuma dojo. Iha often didn’t have a chance to eat before leaving for class. He’d attend class and walk the two hours back home. Whenever possible, students would bring whatever food they had to share. In 1953, the year before he died, Gusukuma moved the dojo to Naha which was an even longer walking distance for Iha – all the way to the west coast of the island. At this time in Okinawa, Sensei Iha explains, walking was just about the only way to get from place to place. Car travel was difficult-the roads were so narrow in places a driver would have to back out if someone came the other way. Even if a person had access to a car, gas wasn’t easy to find. Any travel required a lot of planning so most people didn’t go far from their homes-but there were many who dreamed about being able to travel the island in their lifetime. Gusukuma was one. Iha tells a story about when his teacher decided to walk to the northern tip of the island-a difficult task since there were few roads in that part of the island then. To do this, Sensei Gusukuma had to write out his itinerary for every day of walking, contact people and arrange where to send food in advance. Planning took a couple of years. Iha remembers Sensei Gusukuma’s dojo at Shuri as being a very small room. Only one student could demonstrate kata in front of him at a time. Students might often have to back up from the wall to complete a kata. There could be as many as 6 or 7 students in a class waiting for a turn to show their teacher the “homework” lessons they had been practicing. Gusukuma’s later dojo in Naha was larger- a “three tatami” room (approx. 9′ x 9′). Iha describes Gusukuma as being extremely agile (“like an Olympic gymnast-he could do three spins from a bar hanging from his arms”) and able to focus his punches so that 100 pounds of body weight could exert 300 pounds of power. This power was achieved through daily training of hands and feet using the makiwara punching board. He would often say that if you see someone you think is skilled and want to be as good as them, watch how they practice. If they practice something 10 times, you must practice it 100 times. Iha recalls that Gusukuma’s constant practice of spear hand techique (nukite) by striking bundles of bamboo had caused the nails to drop off all his fingers. These personal stories were related by Seikichi Iha to his students during the fall and winter of 2000-2001 recounting his years of study with Shinpan Gusukuma. One of Yasutsune “Ankoh” Itosu’s students was Gusukuma Shinpan (1890-1954) who was also a peer of Chibana Choshin. Gusukuma, also called Shinpan Shiroma by the Japanese, is virtually unknown due to the fact that he was a very quiet individual who was not interested in spreading the art that he so loved. His only concern was to teach good karate and hence only had a few dedicated students. Gusukuma-sensei would personally teach the top two or three senior students and it was then their responsibility to pass on the methods to the rest of the students. One senior would always be there to teach while sensei observed or trained by himself. Sensei was about 5’1″ and weighed about 125 pounds. He was extremely strong and trained his fists and toes on the makiwara everyday. He believed a karate-man must be able to generate power equivalent to three times their own body weight with either fist or foot. Needless to say, the students were constantly repairing the makiwara punching boards. All styles of Okinawan karate-do stress the importance of the makiwara board. It is said that training with the makiwara develops power through concentration of technique. This ability to “focus” is external power developed internally. Through constant training with the makiwara the student starts developing confidence in their technique. They see that it is stronger than those that have just started and find that through this confidence they are really able to punch and kick harder. This is the usual difference found in Okinawan karate as opposed to the others. Their focus is on power – and the power is extracted from the makiwara. A lot of people can look good punching the air but their power can be seen as lacking or in some cases, non-existent. So, through makiwara training, one can readily see the power generated by training with these ancient pieces of equipment. Gusukuma Shinpan stressed and possessed great power for a man of his size (approximately five feet tall). He believed in being able to hit the makiwara with the equivalent of three times your own body weight. So, if one weighed approximately one hundred pounds, Gusukuma felt that this individual must be able to hit with approximately three hundred pounds of force. Gusukuma strived to developed this kind of power with both hands and both feet. He kept this level of power through training with the makiwara board and striking it approximately 300 times per day with each weapon. He was a firm believer that a measure of a karate person was in their ability to produce this kind of power. 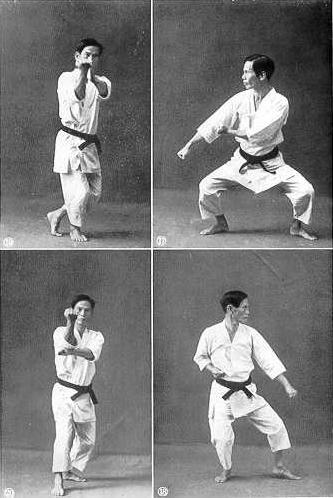 Gusukuma’s teaching methods consisted of kata, kata and more kata. He believe that kata provided the foundation of the body and spirit. He said that the Japanese sword is sharp and beautiful but that in order to get to this end (that is, sharp and beautiful) it must be pounded and tempered with the sweat of one’s body. So the teacher must do the same to the student. If the student is dedicated to the hard training of Okinawan karate, then he can be molded into something sharp and beautiful. After all, Okinawan karate-do, if done correctly, is “sharp and very beautiful” to watch. And like a sharp and beautiful Japanese sword, it is also very deadly. In the kata kusanku-dai, in the kick and the drop down technique, Gusukuma stood supreme. He could kick and travel about eight feet before he dropped down. Gusukuma changed a number of Itosu’s kata and techniques to coincide with his own personal “enlightenment.” He stated that this is a common practice by all karatemen and that it is merely based on human nature to try and improve what one has learned. Gusukuma Shinpan had no fingernails because of his constant practice of the spear hand technique (nukite) on the bamboo bundles that he used as training aids. In Okinawa, one of Gusukuma’s students was a bus driver. One time a drunk got on board the bus and started to cause trouble with the passengers by trying to pick a fight. The student yelled at the drunk, “do you really want to fight?” The drunk was quick to take up the challenge and demanded to fight now. The student then said that he would be more than glad to show him his fighting prowess. At this the drunk became very angry and demanded that the driver open the door so that they could go at it. When the door opened the drunk stormed off and readied himself by taking off his coat. As the drunk got off, the student just simply smiled, quickly closed the door of the bus and drove off with the drunk in hot pursuit. After a several hundred feet run, the drunk fell and threw up on himself. The driver had nothing to prove to the drunk or to himself. All the passengers laughed and told the bus driver that he had used good strategy. Gusukuma Shinpan has three sons and one daughter that are still alive today. During WWII he received a severe concussion from the American bombing that continued to bothered him for the rest of his life. He use to have severe headaches centered around the back of his right ear. The first son is presently a school teacher, the second son is handicapped from falling three stories on his back and his last son is presently a fireman. None of Gusukuma’s sons have equalled their father in his karate skill but the first and the third son are strong enough to teach. None do. Gusukuma Shinpan was a school teacher and very educated while Chibana Choshin never finished high school. He saw the practice of karate as a hobby and never accepted payment for lessons. It should be noted that the common way of paying an instructor during the 1930s, 1940s and 1950s was to bring food for all to share after training. Gusukuma then went to her dojo and requested lessons. He also stated that he would only be in Japan for about three months because he was a high school teacher in Okinawa and that he had to return to teach. The teacher then gave him a wooden yari and showed him how to perform “nuki” (a spear thrust). He was then told to practice for about two or three hours. She then took a long look at the great Gusukuma and said, “I’m glad that you’ll continue to practice. We all need to do this in order to learn the WAY. Thank you for your efforts and good-bye.” She then walked away. 5. Consider the knee the “hinge” of the kick.